We are Cameron and Tyler Winklevoss, but you probably know us as the Winklevii. We are here to talk about Gemini (gemini.com), our new bitcoin exchange. AMA, or rather AUA! We first learned about Bitcoin in 2012. Perhaps where you’d least expect — on an island off the coast of Spain in the middle of August — IBIZA. Our first impression was that this was either going to be really big or a complete zero. We were immediately taken in by Bitcoin’s elegance and enormous promise, and as we started to learn more, we became convinced that Bitcoin was the future of money. We began buying bitcoin, but quickly realized that there was no safe and easy way to buy and sell bitcoin in the US! So, a year and a half ago, we decided to do something about it. We began assembling a team of top engineers to build Gemini — a next generation bitcoin exchange. This past Monday, Gemini opened its doors to the world. We are super excited for Gemini’s journey ahead and look forward to sharing it with you. Please AMA, or rather AUA! What have you done with Gemini to ensure I’m not “gox’d” out of my coins if I choose to use your service? [Tyler Winklevoss] So we built from ground one with a security first mentality, our first 3 hires were security experts. Our chief security officer was the head of security for AirBNB, something like a 15 or 20B company so it’s quite large. He also worked on Google Wallet and at Microsoft with the highly touted security group. We’ve used the best practices, multi-signature technology, hardware security modules, geographically distributed vault systems we’ve spent about a year and a half building state of the art both to prevent from external hacks and internal malfeasance and any type of errors. You know this has been the most important thing for us to think about. We take security really seriously and we recognize that security has been pretty much the downfall of Bitcoin companies before and we’ve tried to learn from that and build the best product possible. When either twin owes for lunch do you use Bitcoin? [Cameron Winklevoss] I always have Tyler buy me lunch. [Tyler Winklevoss] That’s not true. [Tyler Winklevoss] So I don’t usually buy my lunch with bitcoin because I’m worried that I’ll be overpaying down the road so right now I’m holding my bitcoin. When will you offer Gemini to EU people? 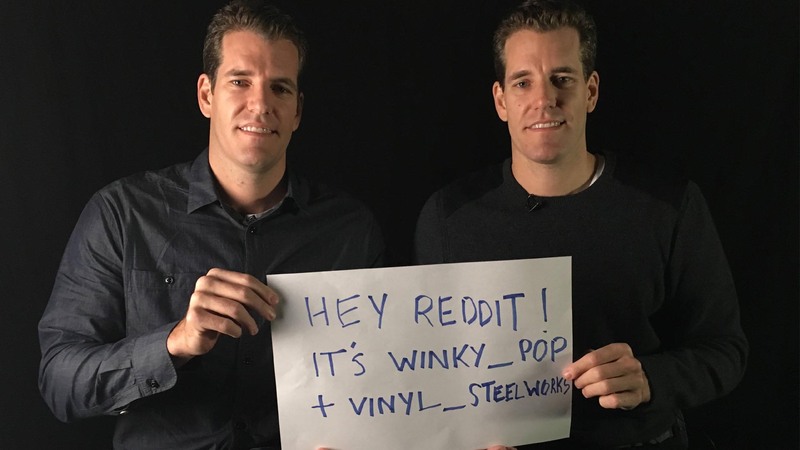 [Tyler Winklevoss] We’re working really hard to expand our offering and areas of operation to Europe and Asia. Unfortunately I can’t give you a specific date, but we know that Gemini is more interesting to our customers if it’s open in as many jurisdictions as possible. So we want this to happen as much as you guys do so we’re working very hard to get to Europe and Asia as soon as possible, but we need to do so in the right way and work with regulators and make sure we’re licensed and ready for you guys. What’s the latest on the ETF? [Tyler Winklevoss] Unfortunately the ETF regulatory process is a close process and we’re not allowed to discuss the latest and greatest with it. We are working incredibly hard to make this happen as quickly as possible, and rest assured that nobody wants this to come to market quicker than myself and u/winky_pop. What is in the immediate future for Bitcoin? [Cameron Winklevoss] I think that right now bitcoin is like the Internet pre-broadband and it’s pretty hard to imagine the Internet fulfilling the promise that it has over the past 20-25 years without that type of infrastructure development. And right now there’s lots of companies like Gemini trying to build the bridges and tunnels and connect the island of bitcoin to the mainland of finance and bringing people into the system. I think using the Internet as an analogy, that’s kind of where we are – we’re pre-broadband and we think that building the infrastructure will be a big part of the growth of the bitcoin economy over the next year. [Tyler Winklevoss] I think that the immediate future for bitcoin (at least in the U.S.) is regulated businesses – licensed businesses, like Gemini. It’s impossible to totally see the future but if you look back to the early days of the Internet, I feel like we’re in the first or second inning of bitcoin so it’s almost like 1993 or 1994 so there is tremendous potential and we think it’s just the beginning. What do you think of ethereum? [Cameron Winklevoss] There are things BC is unwilling or unable to do. I think Ethereum fills in the gap – whether it’s that or something else I think there will be more than one cryptocurrency and each will have its own attributes and profiles, I think it’s an exciting project for sure. How did/do you feel about the craziness that has been Dogecoin and other altcoins? [Tyler Winklevoss] I haven’t personally looked that much into altcoins. I think that with a protocol like bitcoin there’s a huge first mover advantage and a lot of network effects and bitcoin has a great head start in that regard in terms of the size of it’s mining network and how much infrastructure it has going for itself. I think that the altcoins are very interesting. Some of the other blockchain efforts like Ripple and Ether are interesting, but we haven’t spent a whole lot of time with them because we think there’s a lot to be done still in bitcoin blockchain 1.0 if you will. What is the launch date of the ETF? [Tyler Winklevoss] We’re not allowed to publicly discuss the ETF regulatory process, but rest assured we’re working as hard as possible to make it happen and we want this as much as anyone else. Do you plan to add futures contracts like OKC/or a margin/swap system like BFX?, or both possibly? [Tyler Winklevoss] We’re definitely looking at expanding the exchange offering but we want to stay super focused on first things first – and that was getting licensed in the state of New York and having a successful launch but suffice to say we are working hard to expand our airs of operation. What is the plan to bring initial liquidity to the exchange? [Tyler Winklevoss] We have institutional market makers who are going to be providing liquidity on the exchange and we have a lot of demand from just retail and individuals and also other institutions who want to buy and sell bitcoin, so we think the combination of all the customers and also institutional market makers will make a lively and liquid market. Do you expect institutional investors to bring a large influx of new money into the bitcoin market? [Tyler Winklevoss] We worked really hard to bring in the players which are the deepest pockets that were sitting on the sidelines (the institutional players) in to bitcoin who currently really aren’t there – despite how well known bitcoin is and talked about, it’s still very small and the biggest players are not in. They’re not in because there aren’t licensed regulated onramps and gateways to get into bitcoin and so we worked really hard to make Gemini one of those. Fiats on deposit are eligible for FDIC insurance (subject to applicable limitations) and we wanted this to feel like any top-tier financial institution in the world that other top-tier financial institutions in the world were used to dealing with. That was definitely our goal from day one. What other cryptocurrencies would you like to see traded on the exchange? [Tyler Winklevoss] We purposely built our cold-vaulting system to be able to store any type of cryptocurrency, so we took pains to be able to expand beyond bitcoin and as Cameron mentioned, we’re cryptocurrency agnostic in the sense that we don’t have ‘bit’ in our name – we really want to be a platform for any and all digital currencies. Do you plan to add MT4 support, or will you create your own mobile trading app? [Tyler Winklevoss] We completely agree that there’s a need and demand for a highly regulated, compliant and one-stop shop type exchange and we’ve been working hard to meet that demand for the past year and a half. In terms of what features we end up adding, we’re really going to listen to our customers so don’t be shy to send us any suggestions to support@gemini.com – or contact us any other way such as Reddit…and make suggestions to us and we’ll certainly discuss internally and if there’s enough demand and it makes sense, we’ll include them. What makes your exchange different than all the other ones, and why should we trade on it? [Cameron Winklevoss] I think to some extent, you’ll have to come and see for yourself. We focused over the past year and a half on the four crucial pillars of our business – which we believe are product, security, compliance and licensing. Our view of the world is that you have to get all four completely right. I think we did that and I think at least from a product standpoint, which is what users will see the most of, I think we built a very simple and elegant and powerful platform that anyone – from sort of a casual bitcoin user to an institutional trader will be able to harness and use to great effect, I think that we built a really interesting, secure, cold storage vaulting system and we’ve taken licensing and compliance very seriously, which should hopefully be music to most people’s ears who have been in bitcoin and have seen some of the catastrophic failures that have happened over the past couple of years. Do you have a relationship with Mark in any capacity today? What would you say to him if you could? What do you think of what Facebook has become? [Tyler Winklevoss] We don’t have a relationship with Mark. The last time we saw and spoke with him was at the settlement in 2008, and before that was back at Harvard. We do have a relationship with Dustin Moskovitz, we saw him at Burning Man three years ago, and we’ve kept in touch with him. We’ve grabbed coffee with him in SF and also got a tour of the Asana offices (his start-up). We’re pretty friendly with a lot of people around Mark, but we don’t have a relationship as of this moment with him. Hindsight’s always 20/20, but it seemed like a lot of the things that happened were unnecessary. There was a way for everyone to be happy and kind of win, and it didn’t have to be a zero sum situation. Hopefully we can all learn from that as we move forward and become better people and learn to find the path of least resistance. It’s certainly quite an amazing company. I don’t think any of us had any idea of how big it could actually be. I think the scariest thing is that it’s probably not done growing anytime soon. We’re really proud of the part we played, which we think was certainly material to getting it going and I think Mark has certainly done an incredible job shepherding it and leading the company to what it is today. I think that I’m really impressed with what it is and what it most definitely will be. Do you have any thoughts about the ugly contention that’s been going on the last several months in the Bitcoin dev community over hardforking to relax the blocksize cap? [Tyler Winklevoss] We’re definitely watching the block size debate, I don’t have a super strong opinion, I think everyone agrees that the block size in some way or another should increase and will have to increase in order for Bitcoin to fulfill its promise. We’re keeping a close watch, I think its really interesting how the community’s is proposing things and it’s working in a very democratic process and people are free to propose things and obviously it’s a consensus-based system. I think we’re seeing that at play and it’ll be exciting and interesting to see it unfold. I think that Bitcoin will get through this, it’s weathered a lot already and I think its here to stay. I think its just one more of those things we’ll get through. [Cameron Winklevoss] I think that we’re seeing the sausage of a consensus system being made right now. Its not always pretty, but it ultimately will come out and there will be a solution from the community. Its been really interesting to watch the different viewpoints. Both myself and Tyler dont have a strong view on one given proposal at this time other than we agree the block size does need to increase to someone extent. But we’ll continue to keep watching. How has your relationship as brothers affected your business endeavors over the years? [Tyler Winklevoss] The fact that we’re twins and best friends has been a huge asset. We’ve definitely always used it to our advantage. It’s obviously not always easy getting along all the time, but we’ve managed to do it and we’ve made a great team. Both in sports during our rowing career and now financially working together in business. I think trusting your partners is something that’s super important, and we have that built in because we’re twins and if I do something wrong to him then it’s pretty much like doing it to myself. So it’s been a great asset and we’ve tried to make the best of it. [Cameron Winklevoss] I think one of the things that’s helped is that even though on paper and on first glance we might look and appear like the same person we have much different personalities, and given the fact that I’m left handed and he’s right handed we generally approach problems and different things from different angles. I think there’s a healthy discourse and back-and-forth. So we’re not sitting around ratifying each other. We actually have constant dialogue and different opinions. That’s what makes it exciting but also working. So that we don’t get bored of each other. What is the Gemini use case for the regular Joe trying to diversify his assets? [Cameron Winklevoss] I think in a lot of ways, bitcoin can be viewed as a ‘digital gold’ or ‘gold 2.0’, so if you allocate some portion of your assets to gold (probably for disaster insurance, or to hedge against inflation) – you should probably be looking towards bitcoin as another possible alternative to gold. [Tyler Winklevoss] Where Gemini comes into play is that we’re New York-headquartered, U.S.-based, U.S. regulated and licensed platform to buy bitcoin. So if you make the decision to take the plunge and actually bitcoin for your portfolio and you think it’s a good financial investment, then Gemini is a safe and secure home and platform to actually go and execute and buy bitcoin. What are you doing (if anything) to push ‘consumer’ awareness of bitcoin and remove the ‘scary technological hurdles and requirements’ or the huge amount of assumed technical jargon / understanding that the average Joe needs to know in order to get involved with bitcoin and use it in their daily life? 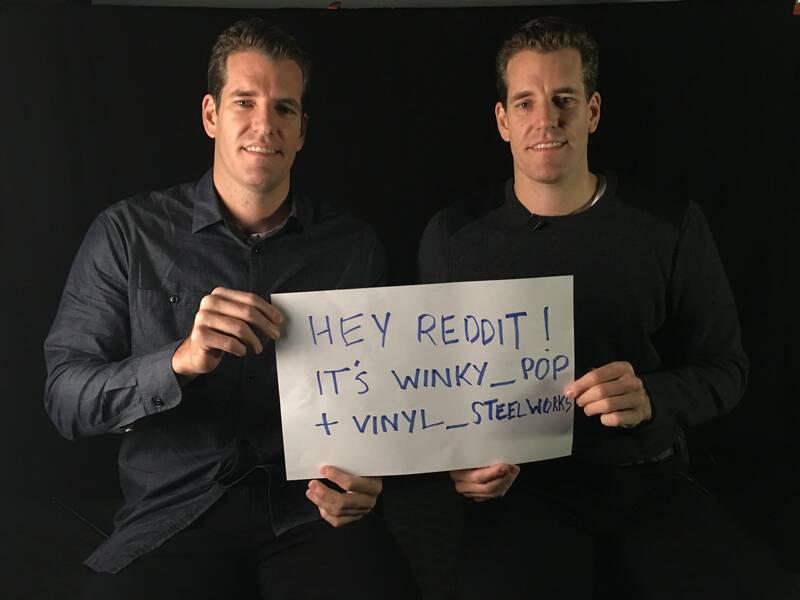 [Tyler Winklevoss] So first off we’re here on Reddit, taking about bitcoin – we’ve learned about bitcoin and been in bitcoin for three years and I can tell you initially it’s a lot to wrap your head around, but we’ve been working hard building Gemini and also we’re working on our ETF that will trade under the ticker ‘coin’ – and so both should be friendly ways to get either bitcoin exposure or actually buy and sell bitcoin. We’re trying to make very regulated, safe and secure environments for people to enter into the bitcoin ecosystem so that’s what we’ve been putting our time towards. What gov restrictions are keeping Gemini from being available in every state? [Cameron Winklevoss] So Gemini is currently operational in 26 states and in Washington, D.C. – we’re working hard to be open and operational in all 50 states, but each state has their various different requirements so there’s no one-size fits all or answer to all 50 states, so we’re approaching them as they come. Some states for example will require Gemini to file as a money transmitter, but that was something we couldn’t do until we were licensed in New York – so there’s contingencies around our approval in various states. And that’s part of the system of Federalism that we’re dealing with, but suffice to say we hope to be operational in all of the U.S. as soon as possible. What’s the cheapest thing you’ve bought with Bitcoin? [Cameron Winklevoss] I think it was a book about Legos, it was sort of like a coffee table Lego Book. Im gonna guess it was $20 or something, I’m not entirely sure. I can tell you the most expensive thing…which was a ticket to space on Virgin Galactic. Who else has seats on your flight? [Tyler Winklevoss] I’m definitely going to be on the flight – this is Tyler. I don’t know how big the flight is. I think its 7 people. I think Bieber is astronaut 500. Maybe Ashton Kutcher is somewhere up there. We have to go to a 3-day astronaut camp before we do this. We’ll get to know who we’re going up to space with. I should probably email Sir Richard Branson and figure out what company we’ll have up there. Should be interesting. How do you see bitcoin evolving in the next few years? Is virtual currency something that has a future or just a speculation with no real actual value? [Cameron Winklevoss] I think the utility of bitcoin is largely in the eye of the beholder, in certain areas of the world it acts as a great store of value where the lets say, the FIAT currency or national currency is being debased or their large capital controls or risk of a collapse. In the US, bitcoin probably, people think of it more as a payment and it has a different application. If you send remittances BC has a utility in terms of being able to send money across borders with low friction and pretty much instantaneously. I think that a lot of times Bitcoins has different use cases depending on where in the world you are. TW: I think we’re definitely past is this a fad of digital currency. I think cryptocurrency is here to stay they’re the future. Everyone including central bankers are embracing it or some form of it. I think in the near future or in US we’ve been building Gemini so its a regulated exchange so that Wall Street and the institutional players can actually get into Bitcoin. Right now it’s still a fringe thing and we’re trying to mainstream it. So I think you’re gonna see it continues to go mainstream. There may be other cryptocurrencies outside of Bitcoin…but in terms of the space of cryptocurrency I think it is the future of money. What do each of you desire? What motivates you to make Gemini a success? What do you mentally focus on to stay engaged and push every day? [Cameron Winklevoss] If the goal was to hang out on an island and sip piña coladas all day, we’d already be down in Margaritaville. I think we just enjoy the struggle and the challenge of building and creating. [Tyler Winklevoss] Yeah, I think when you recognize that life is about struggling and that the struggle is the interesting part – that is when you’re at your happiest, then you really start tapping into a higher level of being and operating. We worked really hard to put ourselves in situations and environments where we had to work really hard. Making the Olympics games in rowing and also making it to a final – nobody cares what your name is, what your bank account is, they don’t care where you came from…it’s what do you have now? How good are you? And are you the right person for the job? Those are environments that we weren’t forced into, we made a choice to be inside – very merit based and difficult because we think that’s the most exciting. We chose a path and we’ve always done that – whether that’s working hard in High School to get into Harvard or beyond Harvard to become Olympians, or now to build a great startup and business called Gemini, we’ve always picked the difficult path and hopefully that says something about who we are. It certainly wasn’t easy, but I don’t regret a second of it. You’re defined by what you do every day and I think that time is your only asset. If you think you have money, what you really have at the end of the day is time. If you think you have friends, you have time. Because once you run out of time, you’ve got nothing. How you use your time, which is your only and your greatest asset, will determine what you get out of this life and who you are and who you become. We’re pretty proud of the way that we’ve spent our time and look forward to spending our time wisely in the future. That’s what’s interesting about life – as Cameron said, we could sit on the couch and play Xbox all day (which is totally cool and we do that too) but all the time it just seems a bit boring. Sometimes people say ‘why don’t you guys do this or that’ – to us, sitting around and not building towards something, not achieving something, not growing as a person seems sort of boring and you’re checked out. I get that, maybe when you’re 75 – but I think right now it’s incumbent upon you as a person to really try and tap into how great you can be and we’re all about that and tend to really find other people who see the world the same way to be the most interesting. I don’t know, I think it’s part of your duty to do that and also give back at the same time. Leave something better off than it was when you got there. Do you believe that Bitcoin will fall to a new form of technological currency? What are the chances that we find another source similar to Bitcoin? [Cameron Winklevoss] As long as Bitcoin is better than gold and has enough of a network effect and first mover advantage it doesn’t have to be the best it just has to be good enough. [Tyler Winklevoss] Yeah Bitcoin’s not competing for perfection and Bitcoin the asset is a better gold when you look at the nine characteristics of money and you match Bitcoin against gold. It is or beats gold across the board. Bitcoin is truly scarce and fixed in supply. Gold is not. Once access to space is cheap people will be able to mine asteroids and asteroids are very rich in gold so that all the chemical elements that you see as precious today on earth are really not precious at all in the scheme of the universe. There will be a day where it’s just not expensive to go and mine an asteroid. So gold and other precious metals will look as plentiful as water or oxygen on earth and the only thing left that is truly fixed and truly scarce will be Bitcoin. That’s just one way to look at Bitcoin and see why it has a really strong and bright future and why precious metals don’t, but there’s also the technology and protocols and so much more that makes it even more interesting. I think Bitcoin’s here to stay for the long term. We’ve already seen a lot of altcoins and other attempts at Bitcoin, but that was a pretty hot thing about a year ago and it feels like it’s pretty much died out. I think that because protocols are winner-take-all in money and a money network has tremendous network effects I think you’ll see something similar to what happened with Facebook. There isn’t really room or need for more than one network. Myspace went by the wayside. Friendster and even when Google tried to compete with it with all their resources they couldn’t. So Bitcoin has a huge head start and I think it’s going to win. At least in the area where it does what it does best, and I think it’s more likely that people will build applications on top of the Bitcoin to harness the security of its mining network, which is by far the largest in the world. Rational economic actors will choose to comply and work with Bitcoin as opposed to trying to build something new. There are certainly things that Bitcoin can’t do today and may never do in the future, and that’s where the opportunity lies to create something different in an entirely new blockchain. We’re already seeing that with things like Ethereum and Zerocash and other efforts to fill the void. Would Gemini have a physical presence, a brick & mortar shop where people can come up and exchange cash for bitcoins? [Tyler Winklevoss] Brick & mortar isn’t on the immediate roadmap. We’re building effectively a digital exchange and bank if you will. So going brick & mortar is kind of the opposite direction, but there are people who are putting out Bitcoin ATM machines that may very well plug into Gemini so that people can go to a physical kiosk and exchange Fiat cash for Bitcoin and vice versa. I think there will be physical touch points for people to buy and sell Bitcoin in the future. I don’t know if we’ll be operating those or we’ll just be the plug-in for those machines. I think in general the trend is that in banking and finance there’s a lot of brick & mortar and it seems like everyday a new bank pops up on the corner, but I don’t think that the younger generation really cares to do banking in a branch and go into an office. When you talk to someone who is in high school about Bitcoin they’re so excited about it. They have no difficulty wrapping their heads around this currency that’s only digital and has no physical form. They don’t need to talk to a bank teller. They don’t need to go into a physical bank. They’re trading credits on their video games. They’re totally comfortable in that world. I think the trend is moving in the opposite from brick & mortars. If I’m proven wrong then we would definitely consider that. We want to meet the demand of what our customers want. If that means gong in one direction or the other then we’ll do that. We’re here to make something that works for you guys. How transparent would Gemini be in the sense what type of regulations will it follow and is there any backup plan if you go bust? [Tyler Winklevoss] We’ve been really transparent from the beginning in terms of regulation. Cameron and I testified at a Bitcoin hearing with the New York State Department of Financial Services about almost two years ago and also opened up a dialogue with the regulators for over a year and a half. So we’ve been speaking with what was Ben Lawsky’s office for over a year and a half. to get our license, which we finally just got a few days ago. Our whole talking point has been we need to go in through the front door and not trying to do an end run around the side. We have been pro smart regulation for a long time. We spent a lot of time educating the regulators on what Bitcoin is and how we thought it should be regulated. So we want to play ball with regulators. To really mainstream Bitcoin we’re going to have to speak the same language with the legacy financial world and we’ll have to look and feel as regulated and licensed as any other financial institution out there. We are now licensed by the state of New York. We’ve tried to check all the boxes so we feel as safe and secure as any financial institution you work with. [Cameron Winklevoss] Our whole approach has been to ask for permission rather than forgiveness. We think that’s the right approach and that our customers will agree. In addition because we went for a trust company charter that makes us a fiduciary, which gives us both powers and obligations to treat the interest of our customers first and foremost, and work with both individuals and institutions. In addition we have to follow the most stringent regulatory policies and capitalization requirements so customers can feel safe because of that. [Cameron Winklevoss] Usually Tyler can, but recently he injured his shoulder so I’ve been putting up a lot more than him so we’ll see. [Tyler Winklevoss] That’s right I can usually bench more. At the moment I can’t as Cameron got so correctly I’m stronger than him. [Cameron Winklevoss] But not right now. [Cameron Winklevoss] I think that in many ways, just follow the golden rule – ‘Do unto others as you would like them to do to you’. Obviously don’t be a pushover and be prepared to walk if someone’s completely unreasonable, but overall if you really want to create long-term value then you want everyone to feel good about the outcome. And I think that all too often, negotiation in movies – or we hear about people who are ‘ruthless negotiators’ and I think a lot of that is probably fiction. You don’t hear about the people who negotiate and build alliances and build value nearly – it’s not as interesting. Just like a lot of times, a lot of the things going on in bitcoin right now are not as good for headlines as some of the less important noise out there. I think that if you’re building a company or you’re building a team and true value, then you want to negotiate with that in mind. If you’re looking for a one-off, yeah you might be successful that one time but you’re not going to build a great reputation in the venture community, in the technology community and you’re not really going to be a true leader. [Tyler Winklevoss] Just to add – life is not a one-off. It’s not one iteration. It’s a (knock on wood) very long term game and there’s a good chance you’re going to run into the same people again, and again, and again. I never really understood the people who can’t see beyond one move on the chess board and recognize that there are going to be consequences for their behavior and their reputation is going to suffer. I can tell you, as someone who’s been investing and building their own investor/entrepreneurship network in Silicon Valley, in LA, in New York and other parts of the world – reputation is everything. Your network and who you know and who has your back and shares deal flow are pretty much everything. If you start burning bridges, you’re going to find yourself very lonely and on an island and probably not as well off as if you had built relationships forward for the long term and really paid it forward. I think that going back to that glass half empty / glass half full mentality…don’t be negative and paranoid. It’s easy to be positive and I think you shouldn’t necessarily think that people aren’t on your side and in the long term that mentality of doing the right thing for the sake of doing the right thing will pay off. I think a lot of negotiation is common sense and how you approach it. I feel like that there’s a fair outcome for any type of negotiation and you should be, in good faith, trying to reach that whereby both you and the other side can walk away feeling like they had a positive, good outcome. There’s certain negotiations where you don’t necessarily have to take that mentality if you really feel like someone is up to no good – but I think in general each negotiation can be a positive outcome for both sides. I think what we’ve found is actually being really transparent in negotiations helps. I think gamesmanship and trying to hide information tends to sort of backfire and you’ve got to ask yourself ‘what’s it worth at the end of the day’? If you’re hiring someone and you’re negotiating salary – is that really the tone you want to set when you are bringing someone on to your team? I think it’s better to say ‘this is what our budget is’ and you ask that person ‘what are you currently making’? I don’t think secrets are necessarily a good thing and having a zero sum mentality, where they have to lose for you to win, also feels like a really negative way for you to approach it – long answer short…I think search for that fair outcome for both parties and that’s a great way to live your life. Even if you leave a little bit on the table, it’ll probably come back to you down the road at some level as even more. Good will, karma – all those things have a place and they have value and you can’t always put your finger on it but when you’re at your trying moment and someone is there wit a helping hand, it may just be that person that felt really good about leaving the room when you were negotiating something years ago. That’s sort of the mentality I would take.